Take the mystery of elementary grade mathematics with this authoritative and reliable guide to the words we use to express math concepts. Conceived and compiled as an ideal reference source for students, teachers, parents and anyone interested in early mathematics education, math terms are defined in a clear, natural way, with language you use every day. Hundreds of illustrations and examples aid explanations, and topics of general interest, such as entries on major mathematicians, are also included. 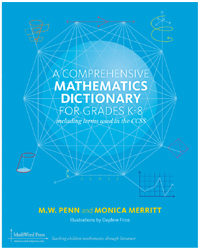 It is, first, a math dictionary that you will turn to for specific information; but you may just find the information between its covers engaging and even fun, making it a book that not only introduces children to the wonderful world of mathematics, but also engages them in an exploration that will last throughout their lives. It will become the most important elementary mathematics reference book you own.